Combine the soda or vinegar, ketchup, brown sugar, molasses, and Worcestershire sauce together. 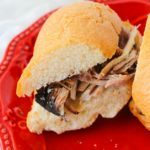 Place the pork shoulder directly in the Instant Pot and pour the homemade bbq sauce overtop to help the seasoning stick. Rub the seasoning into the pork, ensuring that you cover it completely to make a nice bark. Place the lid on your IP, select "manual" and adjust to high pressure for 60 minutes. Natural release. Shred the pork with two forks and serve on buns alongside your favorite coleslaw.